The legend of the dragon is celebrated with this striking Japanese yukata. Navy blue background features gray and white clouds accented with gold. The gilded dragons and calligraphy symbols compliment this distinctive pattern. 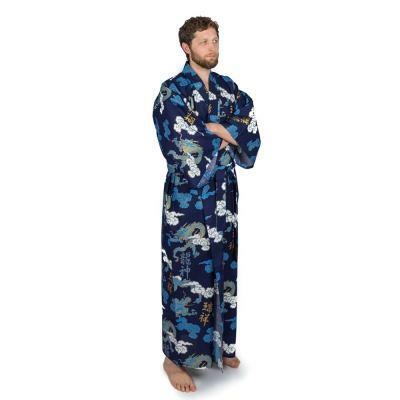 This yukata is made in Japan of 100% cotton with a shrink resistant finish for easy care. This men's yukata has contemporary straight sleeves and a matching belt. This Yukata is perfect for use as loungewear, a robe or as a cover-up at the beach or pool. Small, measures 56” in length and is designed to fit a male 5’ 4" to 5’ 9” in height. The sleeve length is 15”, the shoulder width is 27”, and the girth is 50”. Medium, measures 58" in length and is designed to fit a man 5' 6" to 5' 11" in height. The sleeve length is 15", the shoulder width is 27" and the girth is 50".